At long last, strawberries have arrived and along with them, their trusty partner, rhubarb. I love tart desserts, so strawberries and rhubarb are among my favorite combinations. There are so many fabulous desserts to concoct with these two ingredients but this time around I’m going with a very simple and quick Napoleon. 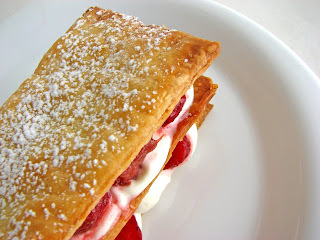 I’ve used a shortcut Sour Cream Pastry instead of the traditional mille feuilles or puff pastry because I don’t want too much butter or fat on the palate in addition to the whipped cream. I want the fruit to shine. I roast the rhubarb with sugar and vanilla until tender. 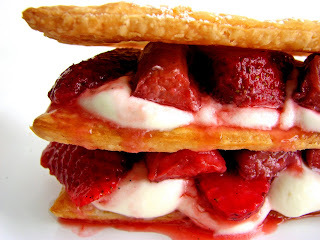 I then add fresh strawberries and sandwich them with whipped cream. An easy and delicious dessert that is definitely in the mode of the first sign of a beautiful spring. - I roll the dough out on parchment paper so it can be lifted onto a baking sheet and placed in the refrigerator without stretching or tearing it. Once the dough is sufficiently chilled, it can be cut and lifted off the sheet very easily. - This pastry dough should be eaten the same day it is baked. For the pastry, combine the flour, sugar and salt in the bowl of a food processor. Add the butter and process until the butter is reduced to small pieces and the mixture resembles course cornmeal for the most part. Add sour cream and yolk and pulse just until the dough starts to come together. Be careful not to overmix. Gather the dough on a piece of plastic wrap and seal it. Chill thoroughly. Remove the dough and let it warm at room temperature for a couple of minutes. Divide the dough in half and place on a lightly floured piece of parchment. Roll each half out to a very thin 1/8”. Using the tip of a sharp knife, score the dough into 4 1/2” x 2 1/2 “ rectangles. Chill the dough thoroughly. Using a sharp knife, cut out the pastry rectangles, place on a parchment lined baking sheet and brush with egg wash. Bake for about 13 minutes until golden brown. Cool. Cut the rhubarb into 1” pieces. Toss with the sugar and flour. Place in a shallow roasting dish or pan. Scrape the vanilla seeds onto the rhubarb and add the vanilla bean. Bake for about 15 to 20 minutes until tender, stirring once to distribute the juices. Cool. Slice the strawberries and fold into the rhubarb. Taste and adjust for sugar. Whip the cream to a soft peak with sugar to taste. Dust the top of the pastry rectangles with powdered sugar. Assemble the Napoleons using 3 pastry rectangles per serving. Layer with cream, fruit and pastry. Serve immediately. Drooooooool! I think this looks amazing! I will have to try it. 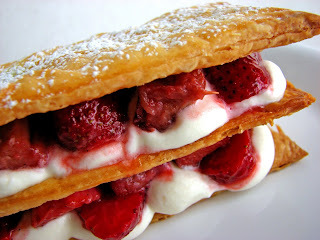 I do love rhubarb and strawberries and in a napoleon! I'm down with that. Thanks for the great post! That looks wonderful!! I love subbing in a different pastry. Puff pastry can be a bit much sometimes. Sounds wonderful! Strawberry and rhubarb is my absolute favourite fruity dessert combo. And 'tis the season. I have been over in England for the last week and the markets are full of rhubarb. Can't wait to get home and back into my own kitchen so I can start playing with this calcium powerhouse spring treat. Hi, I just found your blog thru' blogher and i especially loved this rhubarb recipe! strawberry + rhubarb is one of my favorite combinations! thanks for sharing. i will try these when i get a change. Wow, the napoleon looks so good...very light and tasty. Love the pictures. Oh, this looks absolutely wonderful! The sour cream pastry looks great, I'll have to give it a try. I like what cream cheese does to pastry doughs, and I'm sure sour cream does pretty much the same. Amazing. Looks beautiful for ladies tea. Delicious looking and delicious tasting and quite simple to make! I've never tried this before. This is pure delight and I'm sure to make them again. Keeps me pushing into the kitchen. Yummmyyyy, it looks so delicious…. 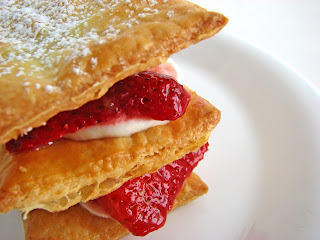 When I was reading the blog then I was feeling hungry….I will love to make rhubarb and strawberries and in a napoleon.